The Jewish Community Center of Greater Albuquerque (JCC) is launching a “Girls Who Code Club” as a FREE afterschool program starting in January 2018. The “Girls Who Code Club” is for girls in grades 6-12 and is open to both JCC members and non-members. JCC is joining with the national partner Girls Who Code and local partner Tech Workforce NM to offer this fun, interactive class. “This is a great way to invest in New Mexico’s kids and economy,” said Paul Perez, Tech Workforce NM Executive Director. Tech Workforce NM (TWNM) is a non-profit, founded in 2017, whose goal is to improve the information technology workforce in our state. Experienced industry professionals work on open-source and other important IT projects, and volunteer to coach and mentor new entrants into the workforce. Girls Who Code was founded five years ago with the belief that computing skills are a critical path to security and prosperity in today’s job market. Girls Who Code began with 20 girls in New York City and has now reached 40,000 girls in all 50 U.S. states. The JCC club will follow the excellent, well-tested Girls Who Code Club curriculum. 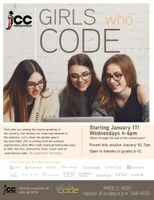 A parent information session for the JCC Girls Who Code Club will be held on Wednesday, January 10, at 7:00 pm. The JCC Girls Who Code Club will meet at JCC on Wednesdays, 4:00-6:00 pm, starting on January 17 and continuing through the end of the school year. Participants will learn with an experienced coder. No prior experience is necessary. JCC of Greater Albuquerque, founded in 2000, is a non-profit organization, open to all regardless of age or religious affiliation. The JCC has modern fitness and athletic facilities, outdoor aquatics center, early childhood education center, and camps on its 7-acre campus. JCC runs a wide variety of community, educational, recreational and social service programs that serve people of all ages.